More Burian for your viewing pleasure, and waffle from me for your reading...er, for you to read. If you missed part one, you missed some very lovely stuff, so go back and read that first why don't you. This week, it's the turn of non-dinosaurian Mesozoic fauna (I'm well aware of the irony of including such a post in a thread named 'Vintage Dinosaur Art', so quiet at the back). Even when compared with the rather dated dinosaurs, many of these paintings have aged badly scientifically (which should please Thomas Diehl) but remain beautiful works of art. 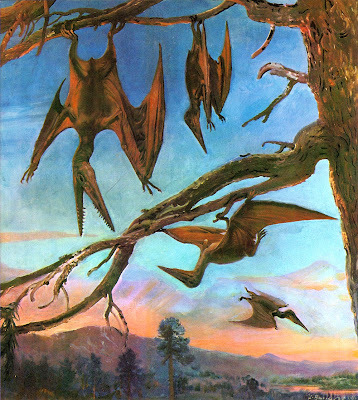 Pterosaurs hanging upside down, like bats, was a popular art meme that has started dying out of late as people have realised that it would have been physically impossible for a lot of them, especially the larger, more advanced species with rather dainty feet. Fortunately, there are no dangling Pteranodon in this book, but these 'pterodactyls' make sure that the meme is present and correct. 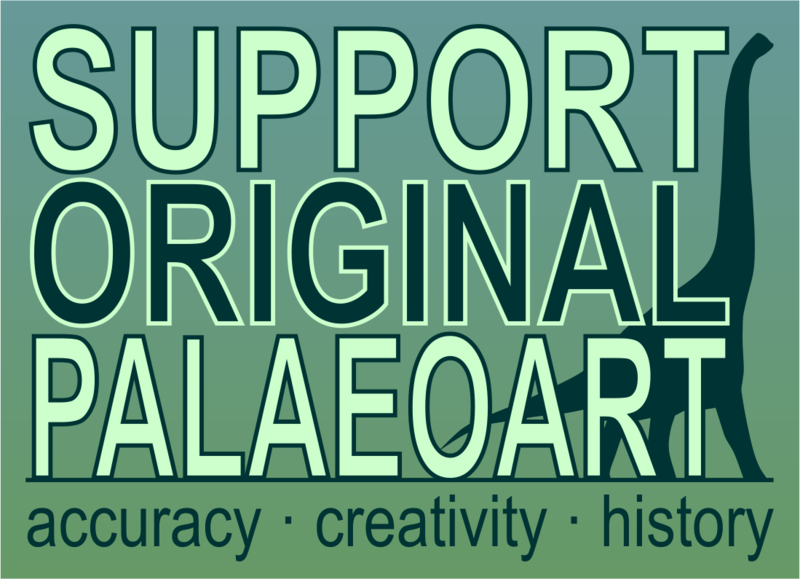 I'm loathe to comment too much on pterosaur art, mostly because I know next to nothing about the animals (for shame etc. etc. ), but even so one can have an intuitive grasp of how historic these restorations are. There's just something off about them - the wings look too saggy, the bodies often too spindly and lizardlike. 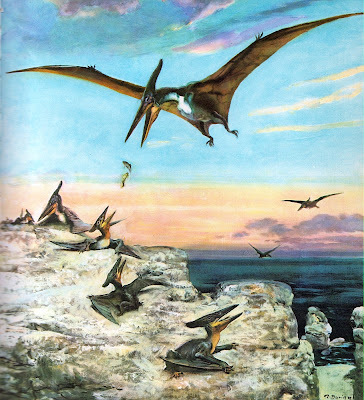 Still, I love this image of Dimorphodon for placing the pterosaur in a highly atmospheric setting, brooding and primordial without being exaggeratedly so; Burian was superb at painting spectacular skyscapes that occasionally threatened to upstage even subjects as charismatic as these. 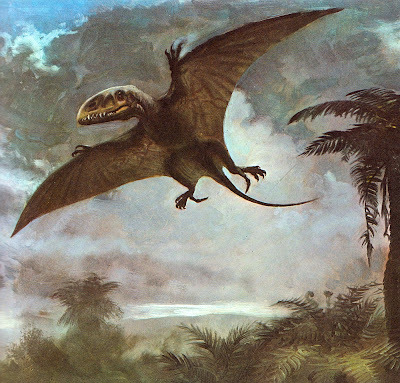 Ah, the classic Burian Pteranodon - an instantly familiar image, mostly because it was copied so much. Here, an adult can be seen accidentally dropping its catch on a group of very young juveniles. Maybe. Note the way that the orange-tinged cloud layer separates the adult from the rest of the scene, emphasising its enormous wingspan. 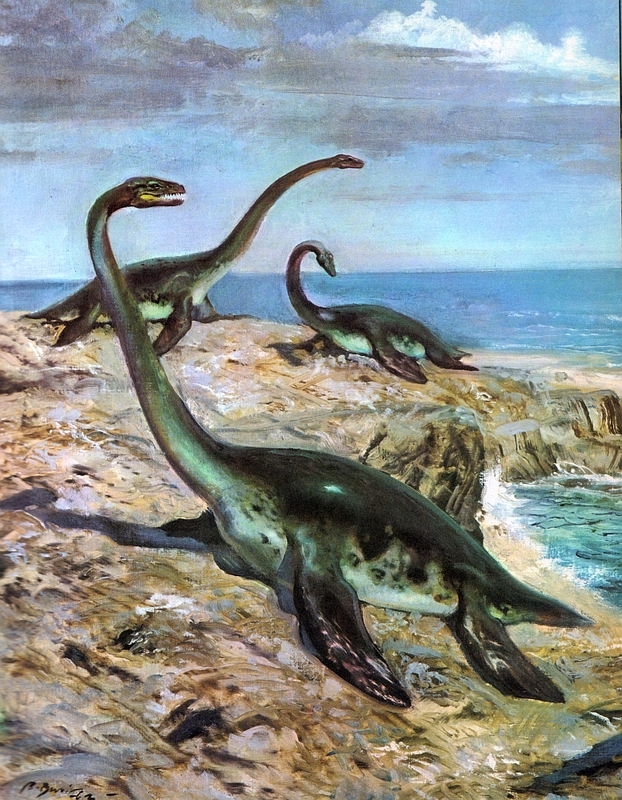 Plesiosaurs were often portrayed over the decades as animals that emerged onto land surprisingly frequently, either to lay their eggs or to sit around sunning themselves (the cocktails with tiny umbrellas were always just out of view). Of course, it turned out that they actually gave birth to live young, and any plesiosaur that found itself in a situation similar to the one above was probably in a lot of trouble. Of course, these painterly Plesiosaurus (from 1962!) remain gorgeous, with the counter-shading of the individual in the foreground being particularly nicely executed. Conflicts between gigantic marine reptiles have fired the imaginations of artists for as long as such animals have been known about, with the most popular clash undoubtedly being that between the mosasaur Tylosaurus and plesiosaur Elasmosaurus. As demonstrated by Burian, the two huge creatures are usually shown facing each other in preparation for battle, and the scene has an air of ancient mythology about it. This is especially true in Burian's case, as his storm-lashed ocean reflects the imagined ferocity of the animals. All it's missing is a sailing ship being thrown around somewhere in between the two beasts. Both of Burian's mosasaurs (this one is Mosasaurus itself) are decked out in crests or 'fins' that run down their backs, another popular palaeoart meme that persisted long after the idea was debunked. This painting demonstrates how Burian excelled at creating a sense of movement in his scenes, which is very obvious here in the fleeing fish, but also in the way that the environment blurs around the mosasaur. 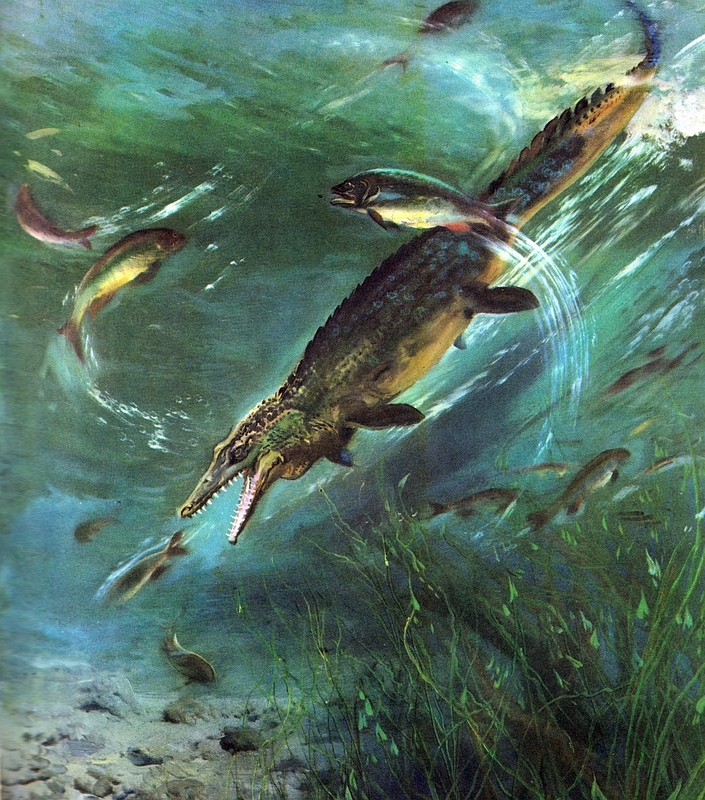 'Leaping' or 'breaching' ichthyosaurs have proven to be another popular palaeoart theme, but - for my money - this work by Burian is one of the most beautiful of all. Once again, the sea and skyscapes are absolutely stunning, and place these Stenopterygius in a world that feels absolutely real. And finally...a mammal (Triconodon), shown here eating a sphenodont (Sapheosaurus). Bah, mammals, who needs 'em? It's not like Burian is famous for his paintings of fossil mammals or anything. Coming up next time: fossil mammals! Or maybe Palaeozoic stuff, I dunno. We'll see! Geez, every one is gorgeous. Burian was downright channeling Winslow Homer in some of these. I also love the countershaded color schemes from a time when many paleoartists had never even thought to examine how modern animals are colored. Gosh, you're right about the Homer comparison. That hadn't occurred to me. Holy cow! Winslow Homer... That's spot-on! Also, love that Sapheosaurus hardly bothered at all by being eaten. "Here, an adult can be seen accidentally dropping its catch on a group of very young juveniles." Is that a reference to at least some pterosaurs having superprecocial young? 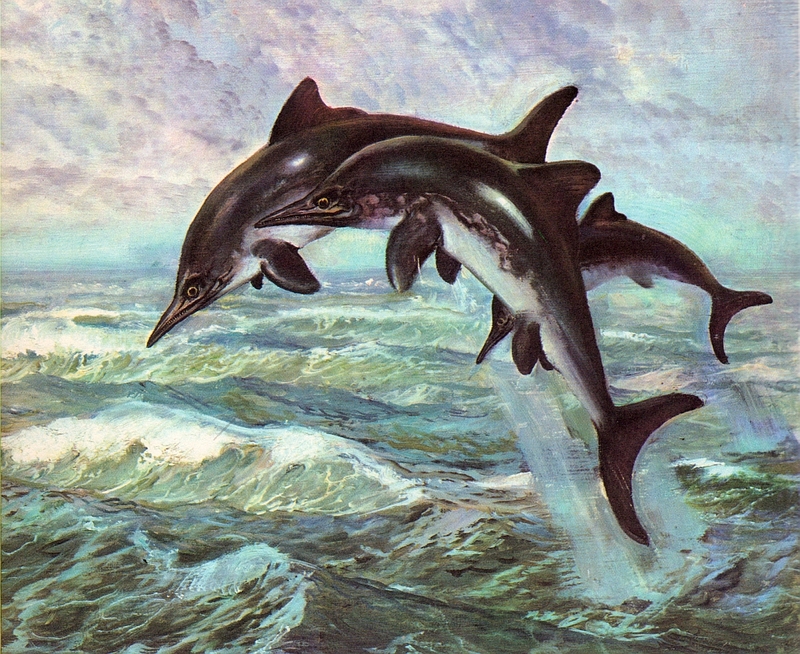 "Conflicts between gigantic marine reptiles have fired the imaginations of artists for as long as such animals have been known about, with the most popular clash undoubtedly being that between the mosasaur Tylosaurus and plesiosaur Elasmosaurus." I've seen this meme continue most recently in "Pteranodon: The Life Story of a Pterosaur" ( http://www.amazon.com/Pteranodon-Story-Pterosaur-Ruth-Ashby/dp/0810957787/ref=sr_1_1?s=books&ie=UTF8&qid=1344295286&sr=1-1&keywords=pteranodon ). "Is that a reference to at least some pterosaurs having superprecocial young?" Classic stuff. I wonder whether the plesiosaurs hauling themselves onto seaside rocks meme started because people took the "snake threaded through a turtle" simile too literally. Something else to wonder about is why viviparity hasn't evolved in sea turtles as it did with several other "reptile" groups that returned to the sea. For The World That's Coming!